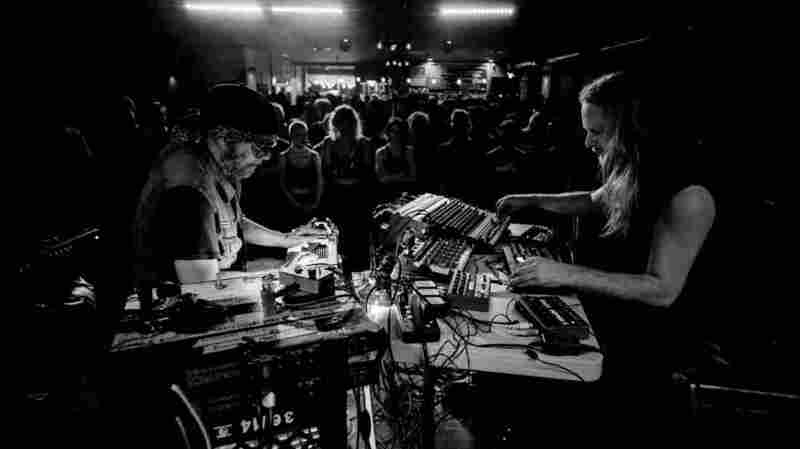 Daniel Lanois (left) and Venetian Snares' Aaron Funk. Daniel Lanois and Venetian Snares are two very different kinds of producers. During the last 30 years, Lanois has become one of his generation's essential record producers, responsible for the likes of U2's The Joshua Tree, Bob Dylan's Time Out of Mind, and a score of collaborations with Brian Eno, including 1984's The Pearl. Lanois favors widescreen sounds and albums with atmosphere, music that invokes that mystical asset of "vibe," no matter what the genre. Venetian Snares is the long-running concern of electronic producer Aaron Funk, whose rapid cuts between shards of noise and ruptured samples have made him a pioneer of what's been reductively dubbed "intelligent dance music." Claustrophobic and intense, his meticulous records produce the illusion of chaos controlled, vibe be damned. But years ago, in a Los Angeles watering hole, Lanois heard Rossz Csillag Alatt Született, an audacious album for which Funk had sampled the sounds of symphonies and string quartets to build his own boisterous electronic simulacrum of a classical ensemble. Lanois was intrigued by the fellow Canadian and soon confessed his burgeoning fandom to Funk. A few years later, they finally convened in Lanois' Toronto studio and, with little planning in place, improvised. In person, Lanois was even more floored by Funk's approach. "I recognized that he knew something I didn't," Lanois tells NPR Music, laughing. "And I always like to work with people who know how to do something I don't. It's a way of broadening my scope." Hearing their bewildering, intoxicating eight-track debut, simply titled Venetian Snares x Daniel Lanois, is tantamount to rubbing one's fingers across a topographical map of some monstrous mountain range. It is a vast landscape, where flat stretches jut suddenly upward into an intricate series of peaks and valleys, nooks and crannies. Aside from his resume as a producer (and occasionally brilliant songwriter), Lanois is a master of celestial pedal steel, mutually inspired by gospel exaltation and minimalist exhalation. Funk cavorts atop that bedrock, making mountains out of chopped, screwed and scrambled drums, and valleys from warped webs of static. Recorded live after their brief studio stint, Venetian Snares x Daniel Lanois finds an altogether unlikely duo locked in feverish instrumental crosstalk — a sort of free jazz duo for the new millennium. On occasion, these improvisations can feel like incidental bedlam, casual composites made by disconnected players who happen to be sharing the same stage and sound system. That's especially true for latter passages of "Best P54," when Funk seems to leave Lanois behind, the furious flit of his electronics bounding ahead of the guitar's gentle peal. It can sound random, and you may momentarily even hate it, wondering why you aren't listening to these two separately instead of through this striated mess. But that is the point, or at least part of it — to connect unexpectedly the disconnected and discover nuance in that instrumental gap. When this pair began partnering, Funk would arrive at Lanois' studio with a set of programmed electronic patterns and filters, to which they'd both respond in real-time. Funk eventually began sampling the guitar as Lanois played it, warping the sound and feeding it back to Lanois. The loop allowed Lanois to respond to himself and Funk at the same moment, blurring the borders between past, present and future moves. At points during "United P92," the album's nine-minute odyssey, you can hear it well — Lanois' guitar and a mutation of it, passing by one another like a body and its ghost. Funk darts around them, his barrage of digital drums, noisy cuts and bass blows goading Lanois onward. There's a depth to the ostensible disorder, a relationship at work just beneath a turbulent surface. The record closes with a proper dénouement, the tizzy of the preceding half-hour evaporating in a two-minute sigh. Lanois' steel guitar radiates like a stately church organ; for the first time, Funk adorns that feeling rather than attacking it, cushioning it between pastel luminance above and warm bass rumbles beneath. The piece is reminiscent of the little astral westerns Lanois conjured with Brian Eno 35 years ago for Apollo: Atmospheres & Soundtracks. It also feels like a suggestion that there's potentially more to come after this restless rendezvous. But if Venetian Snares x Daniel Lanois remains their only collaboration, it will stand as a righteous wonder in two discographies full of them.